"The Neosho Arts Council strengthens and enriches the community by growing appreciation, participation, and support of the arts." 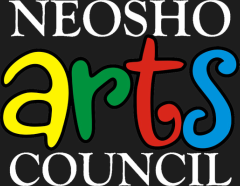 The Neosho Arts Council is a not for profit Missouri corporation whose purpose is to strengthen and enrich the community by growing appreciation, participation and support of the arts through it’s charitable and educational activities as prescribed under Section 501 (c)(2) of the Internal Revenue Code. Donna Divine is a line time Board Member and Past President of Neosho Arts Council. Her love of community and art is what brought her to volunteering with Neosho Arts Council. She and her husband run The Clay Cup offering coffee and pottery in one location. Jackie Kenny came to Neosho from Omaha, Nebraska in 1976 and taught German and Spanish at Neosho High School for 30+ years. Art and Music have always been included in her curriculum. Her main contribution to the arts has been as a horn player for over 50 years, playing in several community orchestras. She has served on the Arts Council for over five years and is currently the secretary. Cory Jones enjoys bringing the arts to life. His enjoyment of theatre and live performance based art brought him to Neosho Arts Council. Sarah Serio is a nationally exhibiting printmaker and native of Neosho, MO. She is full time artists with a main focus as a printmaker. Her work is made in the traditional methods of hand carved, hand inked, hand pulled works. Her work has been exhibited in galleries in New York, Los Angeles, Chicago, Miami, as well as regionally in Southwest Missouri. She has a passion for service to her community and the arts. Visit her art website here and make sure to like her on Facebook and follow her on Instagram here!. Janet Penn is a life long resident of Neosho and her service to community can not be surpassed. Her work as a volunteer spans a range of organizations. She believes the arts build a better community and strives to bring opportunities to who call Neosho home. Matthias Granger has a background in fine art and theatre. His love of creating bridges the divide between the visual and performing arts. He has worked creating props for theatre and turning lumps of clay into functional works of art. Building a community of art loves is what brings him to work with Neosho Arts Council.